Manager Maurice Brosnan said a lot of cattle were being moved earlier this year, with numbers at his most recent sale up 30pc on this time last year. Good cattle were “a savage trade” with €2.40/kg being about the average for the better 550kg bullock as feedlot buyers from both north and south slugged it out. However, lighter dairy cross Angus, Hereford and Friesian stock found the going tough. “There are not many men to buy those light 350-400kg dairy types,” Maurice said. Demand for heavy continental cows from factory buyers saw the better type sell from €2.10-2.15/kg. Glen Cooper reported a “good trade for good cattle” with “your good feeding bull” from 400-500kgs seeing averages range from €2.40-2.70/kg with the top of the pops at this weight making from €2.80-3.17/kg. That top call of €3.17/kg went to a 410kg Belgian Blue. On the Friesian side anything black and white from 300-600kgs sold from €1.30-1.50/kg. The heifer trade saw a share of nice prices especially in the 300-400kg section including a 395kg Charolais who clicked €2.65/kg. Poorer quality heifers were difficult trade. It was a similar story here with John O’Hanlon also reporting that “good cattle were a good trade”, while as at Mountrath the poorer quality light heifer found the going very tough. The 500-600kg bullock averaged €2.24/kg with the 600kg+ animal averaging €2.21/kg. Among the choicer prices were the two 639kg Charolais who made €2.58/kg. Averages on the heifer side saw 300-400kg make €2.20/kg, 400-500kg €2.16/kg and the 600kg+ heifer averaged €2.12/kg. A big sale with a good trade for all classes was the story here with the forward store and beef animal leading the way. Hereford and Angus beef bullocks sold from €600-1,040/hd with the €/kg while those of a store weight made from €300-840/hd with their weight. Heavy Friesian bullocks sold from €380-605/hd over the €/kg, while lighter Friesians made from €100-300/hd with the €/kg. Beef cows were a flyer with prices ranging from €460-790/hd with the weight while feeding cows sold from €/kg to 425/hd with their weight. Moving 365km north-west of New Ross to Raphoe we also find a mart with increased numbers and a strong trade for the beef and forward type animal. The price range here saw bullocks sell from €2.00-2.60/kg with heifers making from €2.10-2.80/kg. Weanling bulls made from €1.90-2.60/kg, while the fat cow market saw prices from €600-1,785/hd. The only negative, and it is more or less a nationwide trend at this stage, is that lighter plain cattle were difficult. There were bigger numbers here also but trade remained strong for the good animal. Some top sample prices on the heifer side saw a 545kg Charolais X make €2.32/kg, followed by a 445kg Limousin at €2.57/kg while a 345kg Piedmontese X made €2.58/kg. On the bullock side you had a 565kg Charolais striking the ball well at €2.27/kg, while at €2.27/kg a 455kg Aberdeen Angus was not found wanting. 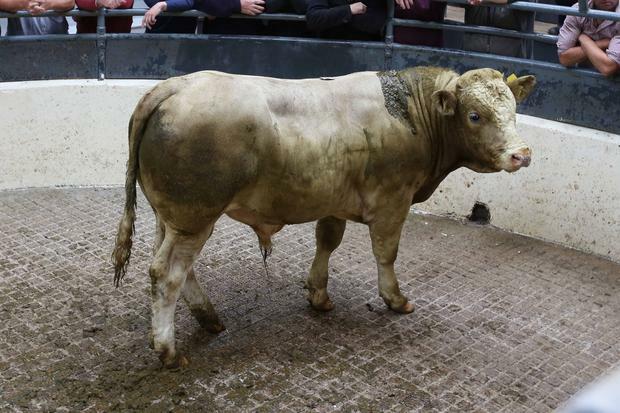 Top price among the bull weanlings went to a 284kg Charolais who clicked €2.76/kg. On the cull cow side top price at €2.10/kg went to a 630kg Limousin. Not everybody from this part of the world had headed to Croke Park on Saturday in advance of Sunday’s All Ireland, enough hardy bucks were ringside here to drive prices for bullocks to a top of €2.66/kg. fails to give hope. Top price among the heifers was the €1,310 paid for a 550kg Charolais.